As I mentioned I’ve been trying to catch up with my blog reading and have come up with more posts which I found interesting and/or impressive. If you haven’t read them you may also find them useful. Julie (Angler’s Rest) announces the Society of One Place Studies. Kim from KK Genealogy has written a wonderfully evocative piece for the Book of Me’s Prompt 9 on Time Capsules. Alona (Lone Tester) suggests we should check out Facebook for the myriad local history pages that are blossoming there. Jana’s Genealogy on Rootsmapper, a tool to help with mapping where your ancestors lived. Have you ever pondered the meaning of cousins once removed etc? Wonder no more, as this post explains it quite simply. 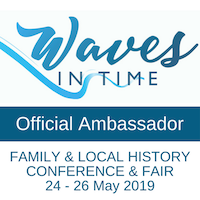 Toowoomba & Darling Downs Family History Society has completed more indexing of the Toowoomba Chronicle, check this link and also their sidebar. Want to know how to use Digital Imagery as a Tool for Historical Research? Follow the Archives Outside link on this topic. Or tips on photo management from Genealogy’s Star. A sad reminder on the Return of Childhood Killers by Historians are Past Caring. If you doubt their impact on families in recent memory, you should read Catherine’s personal story on Vaccinations. One Cool Site’s Timethief, suggests how we can craft quality blog comments. John from Canada’s Anglo-Celtic Connections (revamped title) has some interesting links for us on Welsh records, an interactive 19th century London map, and the UNESCO Memory of the World project. Clare County Library: New History of Corofin Parish will appeal to anyone with ancestors from that area. 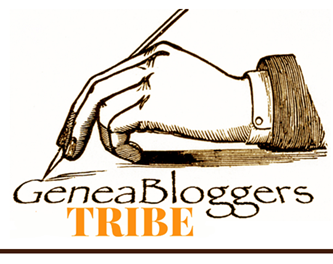 And then there’s James Tanner’s Genealogy’s Star blog: I’m not going to pick out any one post. If you don’t follow James’s posts, why not go over and have a look. It’s rare for me to find one that doesn’t make me think. From a Facebook post by Inside History: Google tools you didn’t know existed ….I certainly didn’t. For my fellow grammar fiends, this article recommended by Liv Hambrett is intriguing. English really isn’t the same everywhere. Hope you find some of these mentions useful or just plain interesting reading. 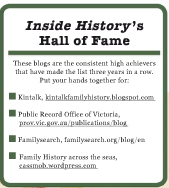 Following in Geniaus’s footsteps from last week, I thought I’d share a list of my favourite blogs beyond family history (though some do venture into that territory). Why don’t you have a look and see if any of them appeal to you as well. I read them for their different perspectives, an insight into their worlds and their well written posts. A baker’s dozen of authors. 52 Suburbs (An Aussie on the move around the world, looking for the unusual, great photos juxtaposed in a way that most people wouldn’t think of. Thanks Crissouli for this tip-off). French Essence (can’t believe I somehow omitted this today. A great series- yet another Aussie –living in France. To-die-for photos of life in Provence. Can happily leave the fashion, but the Provencal influences are another story). I’ve also recently started reading View from the Teapot about life in France and Fat Dormouse Getting Thinner. 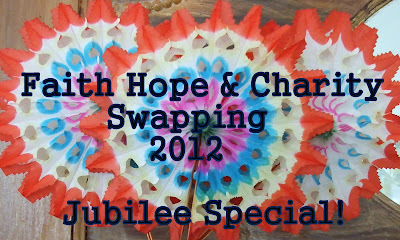 Alison who writes both blogs is my exchange mate in the Faith Hope and Charity Jubilee Swap and as luck would have it we’re both mad cat lovers We’ve both been working on our gift package and I’m hoping to get mine off to Alison today. It’s been fun picking stuff up to send to Alison and it will be fun to see what everyone comes up with. Fingers crossed Alison likes what I’ve found for her. Thanks Julie for bringing this fun activity to my notice.